Few would dispute the importance of Jim Burns's contribution to the development of the electric guitar in the UK. The fact that he designed Britain's first solidbody guitars and basses would have been enough to guarantee him a place in the history books, but Jim's accomplishments went far beyond that. Through the guitar's boom years in the early 1960s, Burns instruments were the choice of many rising stars of the 'beat group' scene, including the Honeycombs, the Searchers and the Troggs. With the launch of the Burns Marvin in 1964, Britain finally had a solidbody electric that was fully equivalent in terms of sound and performance to its American counterpart, the Fender Stratocaster. Here we take a look at the story of the Burns company, which this year celebrates its 50th anniversary, taking in a rather special example of the Marvin model along the way. Supersound In 1958, Jim Burns joined forces with Alan Wootton of the Supersound amplification company to develop and manufacture a line of solidbody guitars and basses. A makeshift workshop was set up in the basement of Jim's rented accommodation at 131 Queens Road in Buckhurst Hill, Essex and Jimmy and Peter Farrell, the sons of Jim's landlady Louise Farrell, were recruited as 'helpers'. Though they were primitive when compared to the instruments that Jim would build a few years later, the Supersound guitars and basses were nevertheless significant in being the first of their type to be manufactured on a commercial basis in the UK. Supersound's sole advertisement pictured the 'Ike Isaacs Short Scale' model, a single-cutaway Les Paul-like solidbody. Jim Burns later stated that he made around 20 of these, but all of those that have since surfaced actually bear the later 'Burns Weill' badge suggesting that few, if any, Supersound examples actually made it onto the market or survived. Burns-Weill The collaboration with Alan Wootton lasted less than a year, but Jim's appetite for guitar making had been whetted. He promptly entered into a similar arrangement with amplifier manufacturer Henry Weill. Once again Jim took care of the woodwork while Henry supplied the pickups and electronics. Marketed under the 'Burns-Weill' banner, the resulting instruments were the first to bear Jim's name. The range, which included both budget and professional quality models, comprised three solidbody guitars together with matching basses. Styled after the Japanese-built Guyatone/Antoria guitars (as used by guitarist Hank Marvin in his days with the Drifters), the Fenton guitar was priced at £35 while the futuristic RP2G Streamline Guitar retailed at a hefty £56. Jim's partnership with Henry Weill ended acrimoniously when Jim decided to set up his own company, Ormston Burns Ltd, in late 1959. Henry continued to manufacture revised versions of the Burns-Weill models, now under the Fenton Weill brand name, but his efforts were ultimately eclipsed by the success enjoyed by Jim Burns in the following decade. The Burns Company The first guitar to carry the 'Burns' brand name, the Short Scale De-Luxe Artistes (sic) model, was unveiled in late 1959 and Ormston-Burns Ltd  a partnership that included Jim Burns, Louise Farrell and her sons Jimmy and Peter  was officially established the following year. The early Burns line included the Artist, soon superseded by the Vibra Artist, and the small-bodied Sonic model, plus bass versions of both. Unlike the offerings from Watkins, Vox, Dallas, Rosetti and other UK-based companies, Burns products were never built to a price. The company's cheapest six-string, the Artist, retailed at £51 (equivalent to around £900 in today's money) while the top of the line Vibra Artist model sold for the princely sum of £78, a serious investment at a time when the average adult wage was around £7 per week! The introduction of the Black Bison in December 1961 reflects the confidence that Jim Burns must have felt in his new venture. With its all-black finish, forward sloping horns and gold-plated hardware, the new guitar made a bold visual statement. Innovative features included four Ultra-Sonic pickups (developed with the help of the Goldring hi-fi company), novel 'Split Sound' circuitry, a newly designed 'boomerang' tremolo unit and a 'gear box' truss rod system that was concealed within the neck heel. The model's £157 price tag singled it out as the most expensive British-built solidbody guitar of its era. In practice, the Black Bison proved completely uneconomical to manufacture and as a result, just 50 examples of the original four-pickup version were made before the model was redesigned with three pickups, a bolt-on neck and a simplified vibrato unit. The Marvin Model Over the next few years the Burns Company added several new models to its line including the Split Sonic, the Jazz Split Sound guitar and the semi-solid TR2. With the introduction of the Marvin in December 1964, however, Burns came of age. That Hank Marvin  the lead guitarist with the UK's top instrumental group, The Shadows  should have laid aside his famous red Fender in favour of a British-built Burns guitar represented a remarkable coup for Jim and one that he could hardly have envisaged just a few years earlier. The Shadows, who were experiencing tuning problems with their Fenders, had approached Jim with the request that he build them a Stratocaster-style instrument that would play and stay in tune. According to Hank, around 30 prototypes of the new model were assembled before the guitar finally met with his approval. "The 24 months of waiting was a nuisance but it all seemed worthwhile when we first began to use them," Marvin told the readers of his Beat Monthly column. Taking Hank's Fender Stratocaster as a point of departure, Jim had incorporated various 'improvements' including the newly designed Rezo-Tube vibrato unit and Rez-o-Matik pickups. With a £173 price tag (around £20 more than a sunburst Fender Stratocaster), the Marvin replaced the Bison as Burns's flagship model. Baldwin & Beyond In the 1960s, guitar-based pop music was seen as a passing fad and the Farrells were keen to sell before the bubble burst. With this pressure behind him, Jim accepted an offer from the American Baldwin Piano and Organ Company (which had earlier failed in an attempt to buy Fender) and the entire Burns operation was sold to Baldwin for £250,000 on September 30th 1965. Jim Burns remained with the company as a consultant but left after about a year. Initially little changed, but in mid 1966 Baldwin decided to rationalise the range, dropping several models in the process. Those that remained were subjected to a design overhaul that was intended to facilitate production. A visible consequence of this 'restyling' was the 'flattened scroll' headstock now seen on the Bison, the Marvin and most other Baldwin models (only the Double Six 12-string and G.B.66 De Luxe hollowbody escaped intact with their original flat headstocks). By the close of the decade, interest in the Burns/Baldwin instruments had diminished to the extent that Baldwin decided to pull the plug, focusing instead on the Gretsch guitar and drum lines that it had acquired in 1967. After Baldwin Having left Baldwin, Jim Burns continued to develop his ideas, initially under the Ormston banner, since Baldwin now owned the 'Burns' brand name. In 1969 he joined the Dallas Arbiter organisation, where he collaborated with ex-Vox employee Bob Pearson on a line of guitars and basses that were sold under the Hayman brand name. In 1973, Jim was employed as designer and production controller for a Newcastle-based musical instrument retailer that operated under the Burns UK banner. Despite its name, the operation was not owned or run by Jim, who had effectively relinquished the right to his own name once again. Burns UK models included the radically shaped Flyte guitar, the angular Hank seems suitably pleased: it's said that the scroll headstock was his idea Mirage and the LJ24. The 1980s saw Jim Burns resume guitar manufacture under his own name, this time as part of the PA:CE electronics group. Production began in 1980 with a series of all-new designs that included the eye-catching Scorpion, a model that found favour with Blondie guitarist Chris Stein. Interest in the classic Burns designs continued, however, and in 1981 the company responded by reissuing the Marvin and Bison guitars. Unfortunately, creating authentic reproductions was deemed uneconomic and as a result many characteristic details were sacrificed, including the Marvin's Rezo-Tube vibrato, which was replaced by a generic Strat-style unit. Poor management and inconsistent build quality resulted in disappointing sales and the company was gone by the mid 1980s. Burns London In the 1990s, Burns guitars began a much more successful rebirth. Founded in 1992 by Barry Gibson, with Jim Burns on board as a consultant, the Burns London Company set out to produce new Burns guitars in the spirit of the original models, beginning with the Legend, an accurate reissue of the Marvin. 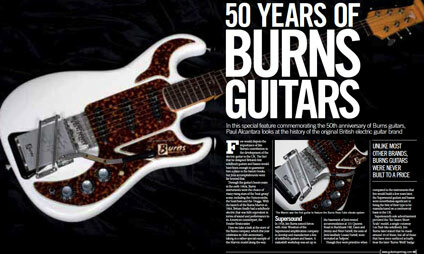 Initially building guitars by hand in the UK, Burns London began producing guitars in the Far East in 1999 and today offers a full catalogue of electric guitars and basses, from the affordable Club Series to the upmarket Custom Elite range, together with limited edition instruments, such as the Dream guitar reviewed this month on page 26. Our Guitar Designed to replace the early 1960s Fender Stratocasters that Hank Marvin and Bruce Welch were playing at the time, the Burns Marvin incorporated a number of Fender-like features that included a 21-fret rosewood fingerboard, 25.5-inch scale length and three single-coil pickups. The model's circuitry was virtually identical to that of a Strat, with a single volume control, two tone controls and a three-way pickup selector switch. (The earliest examples were fitted with a rotary switch mounted on its side in place of a regular three-way switch, presumably because a suitable switch wasn't available in the UK.) However, other details such as the three-a-side scroll headstock (a feature suggested by Hank himself ), three-section split pickguard and zero fret lent the Marvin a distinct visual identity of its own. The Marvin's 'Rezo-Tube' vibrato employed a knife-edge pivot and individual string anchor tubes, hence the name. To get around Fender's patents, the tension springs were mounted backwards beneath an extended baseplate, also adding to the model's unique look. Tension could be adjusted via a pair of bolts at the end of the baseplate. Early examples had a mahogany body and a natural-finished 'steamed beech' neck (the steaming process increased the timber's stability by reducing its resin content). Burns later substituted an obeche body (perhaps Hank and Bruce found the earlier mahogany bodies too heavy) and began using sycamore, a species of European maple, for the neck. Most Marvins were finished in white polyester and fitted with a brown or grey tortoiseshell plastic, three-piece split scratchplate. Custom colours were also offered, which came with black plastic scratchplates, though these sometimes appeared on white finished examples as well. Initially Burns glued the two small sections of the scratchplate in place but soon switched to attaching them with screws  both the slot-head and Phillips variety can be found, sometimes appearing on the same instrument! Details such as the size of the scratchplate engraving, the position of selector switch, the vibrato hand-rest and the top strap button also varied. Back in the 1960s the detailing of Burns guitars was largely carried out by hand and as a result, the neck profile and the size and shape of the headstock scroll varied from one guitar to another. Mighty Marvin The Marvin pictured here belongs to the Managing Director of Burns London, Barry Gibson. According to Barry it is a pre-production model and details such as the switch angle and the full-width 'Rez-o-Matik' pickup engraving certainly point to an early date of manufacture. The guitar's body has been refinished and the two small scratchplates, which would originally have been glued in place, are now secured with Phillips screws. "The guitar was originally fitted with an unusually long vibrato arm," Barry comments. "It was half as long again as the standard Marvin arm and I ended up playing over the neck pickup all the time!" A reissue arm has since been fitted and the original stored safely in the case. Around 300 original Burns Marvins were produced before the company was sold in 1965. Baldwin continued to produce the model for a further five years but most collectors prefer the original Burns-branded guitars. All told, this is a very nice example of what is undoubtedly Burns's most sought after model.